Spread across 300 acres in St. Paul, Minnesota, Fort Snelling is steeped in history and aura. Originally built as Fort Saint Anthony in the 1820s, the structure resides on Native America land (Dakota homeland), strategically situated at the confluence of the Minnesota and Mississippi rivers. Today, the Minnesota Historical Society runs the fort, which is located atop a bluff along the Mississippi River. Named a “Natural Treasure” by the National Trust for Historic Preservation, Fort Snelling and the surrounding area are a sight to behold. That’s why when the Northern Star Council for the Boy Scouts of America, which serves communities across central Minnesota and western Wisconsin, sought to expand its headquarters there, nothing but the best was considered for the undertaking. The $17 million expansion included the addition of the Peter J. King Family Foundation Leadership Center. 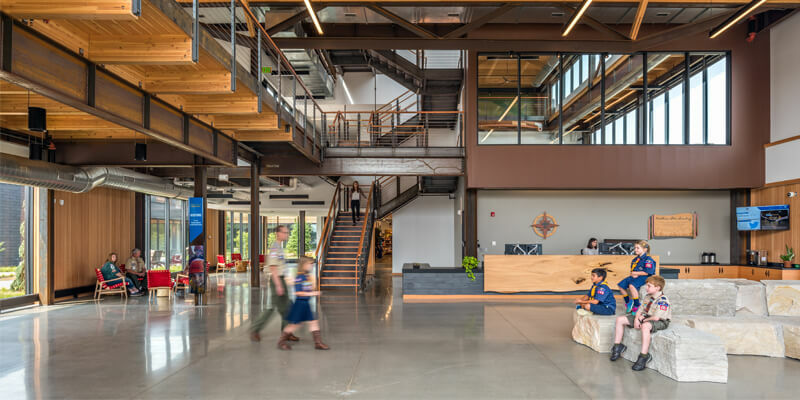 The new building features an atrium/welcome area; expanded retail shop; interactive technology room for kids; several meeting rooms; a climbing tower; and a team-focused high ropes challenge course. The Council also moved its two offices in St. Paul and Golden Valley into the Center. 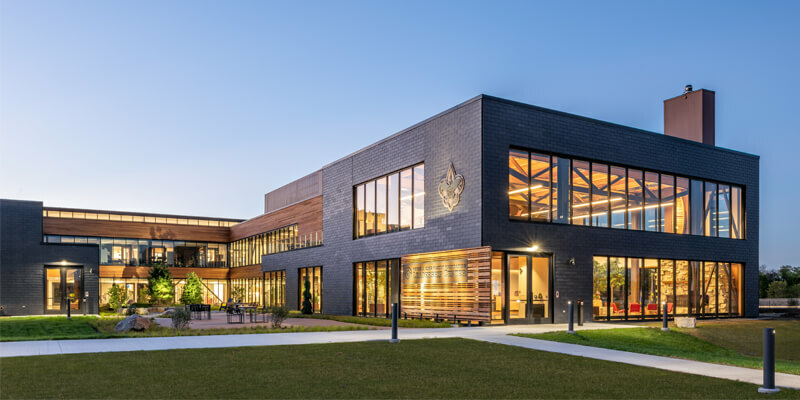 As the design and construction team, the concerted effort of Cuningham Group Architecture Inc., Mortenson Construction and the Vermont Slate Co., set out to make Council’s vision a reality, there was work to do. For starters, they had to be sensitive to what materials used in the process because the project sat within an historic district, thereby limiting what would be consistent with the building context. 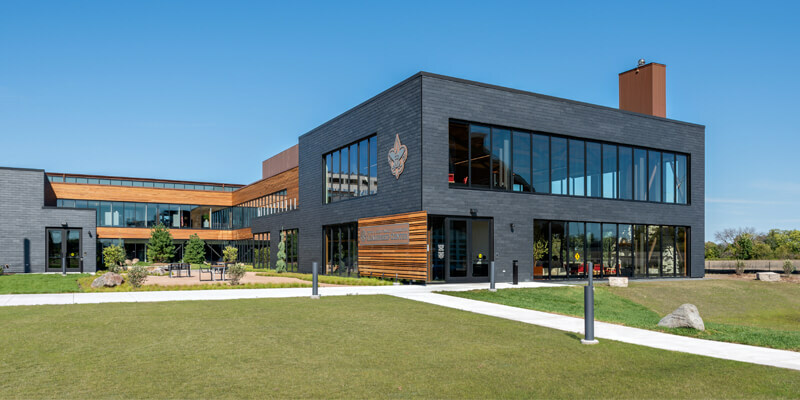 In addition, because Minnesota is known for its extreme climate, they needed a wall system and cladding that was able to withstand the large temperature swings. 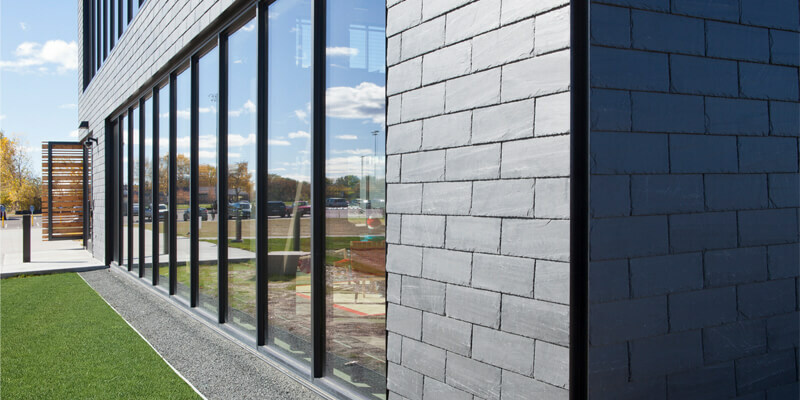 “They wanted the environmental benefits and efficiency of a ventilated rainsscreen, the look of a natural product, the 100-plus year durability of natural slate with virtually no maintenance and a price that was competitive with other rainscreen systems,” says Ken Rule, owner of Vermont Slate, which has been distributing CUPACLAD on a national basis since 2016. The design and construction team settled on CUPACLAD 101 Logic material, a natural slate that helped reflect the values of BSA because of its natural properties, longevity and aesthetic qualities. Natural slate also had historical value as a roofing and cladding material. For hundreds of years, slate roofing has been used on castles, cathedrals and homes. Revered for being a durable and long lasting material, the material is capable of withstanding shock from hail, acid rain, and even hurricane-force winds without breaking. On average, a quality slate roof has an expected lifespan of more than 100 years. As an added bonus, the minimal processing of natural slate makes it one of the most environmentally-friendly building materials on the market. 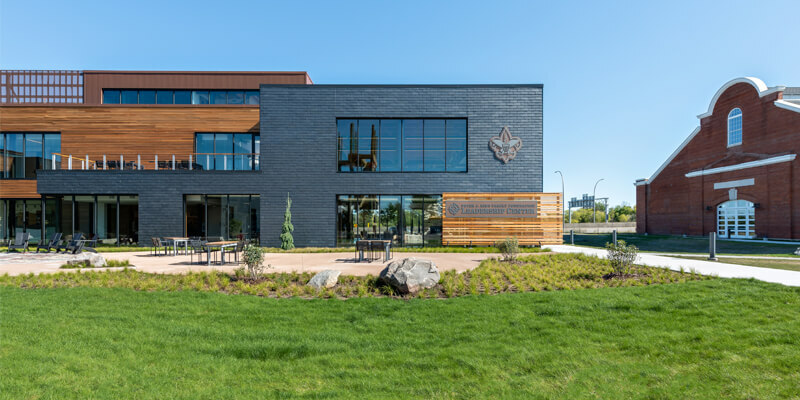 “The slate contributed to the overall aesthetic with its modern metallic luster and yet modest-compliment to the historic 1913 Calvary building that sits adjacent to the BSA Leadership Center,” says Chad J Clow, AIA NCARB, principal at Cuningham Group Architecture. And along with its aesthetic capabilities, the material is lauded for its sustainability. As stewards of the Northern Star Council, the project team also was diligent in identifying cost-effective solutions while maintaining the design integrity. That’s why early in the planning stages, the project team locked down slate as the wall cladding system. “CUPACLAD was an ideal choice for the project, as it achieved the designer’s aesthetic intent; as a pre-engineered rainscreen system,” says David Wood, project manager for the Minneapolis Operating Group at Mortenson. In addition, the project team implemented a rainscreen cladding concept—a kind of double-wall construction that utilizes a surface to help keep the rain out and an inner layer to offer thermal insulation, prevent excessive air leakage and carry wind loading. The surface or slate in the example breathes just like a skin as the inner layer reduces energy losses. The Center, named in honor of the King foundation’s $4 million gift in Northern Star’s capital campaign, opened in summer 2018, helping usher in a renewed commitment to the positive influence the Council makes in the lives of the 25-plus communities it serves.